CLEVELAND, OH - July 26, 2010 - The Cleveland Cavaliers have acquired guard Ramon Sessions, center Ryan Hollins and Minnesota’s second round pick in the 2013 NBA Draft from the Minnesota Timberwolves in exchange for guards Delonte West and Sebastian Telfair, Cavaliers General Manager Chris Grant announced today. Sessions, 24, played in all 82 games (one start) during the 2009-10 season, averaging 8.2 points on a career-high .456 shooting, 2.6 rebounds and 3.1 assists in 21.1 minutes per game. His 3.1 assists per game ranked 8th among all reserves last season. Prior to signing with the Timberwolves before the 2009-10 season, the 6-foot-3 guard played his first two seasons with the Milwaukee Bucks. He posted career highs in scoring, assists and steals during the 2008-09 season, averaging 12.4 points on .445 shooting, 3.4 rebounds, 5.7 assists and 1.1 steals in 27.5 minutes per game in 79 games (39 starts). In the 39 starts, he upped his averages to 15.1 points on .444 shooting, 4.2 rebounds, 7.6 assists and 1.3 steals in 33.7 minutes per game. Sessions finished the 2008-09 season ranked among the league leaders in assists-to-turnovers ratio (8th at 2.97) and assists per game (18th at 5.7). The South Carolina native set the Bucks franchise record in assists with 24 while scoring 20 points against Chicago on April 14, 2008, also becoming the first player in Milwaukee franchise history to have at least 20 points and 20 assists in a game in the process. Sessions scored a career-high 44 points on Feb. 7, 2009 versus Detroit and on 17 occasions in his career has recorded double figures in assists. In his three-year career, Ramon, pronounced “ra-MAHN”, has averages of 10.0 points on .449 shooting, 3.0 rebounds and 4.7 assists in 24.4 minutes in 178 games (47 starts). Hollins, 25, set career bests in nearly every statistical category during the 2009-10 season. The 7-foot center averaged 6.1 points on .558 shooting, 2.8 rebounds and 0.7 assists in 16.8 minutes per game in 73 games (27 starts). The 7-foot center scored a career-best 19 points on two occasions during the season (Nov. 25, 2009 vs. Denver and Jan. 29, 2010 vs. the Los Angeles Clippers) and averaged 9.2 points on .610 shooting and 3.7 rebounds in 22.8 minutes per game in his 27 starts. Over his four-year career, he has averages of 3.9 points on .541 shooting, 2.2 rebounds and 0.5 blocks in 11.6 minutes in 205 games (31 starts). West averaged 8.8 points on .445 shooting, 2.8 rebounds and 3.3 assists in 25.0 minutes per game in 60 games (three starts) during the 2009-10 season. 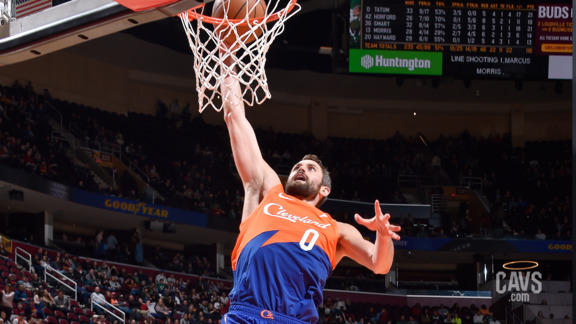 In 150 career games (93 starts) with Cleveland, he averaged 10.3 points on .450 shooting, 3.1 rebounds and 3.6 assists in 29.7 minutes per game. Telfair, acquired by the Cavaliers on Feb. 17, 2010 from the Los Angeles Clippers in a three-team trade, played in four games with Cleveland, averaging 9.8 points on .457 shooting, 1.0 rebounds and 3.0 assists in 19.5 minutes per game. Over his six-year career, he has averages of 7.9 points on .390 shooting, 1.6 rebounds and 3.9 assists in 23.6 minutes per game in 392 games (181 starts).